The approximate 6.5-mile/8-foot diameter Perris Valley Pipeline (PVP) was recently constructed to convey up to 150 MGD of Metropolitan Water District (MWD) water from a facility located near the I-215/Oleander Ave intersection to the Henry J. Mills Water Treatment Plant (Mills WTP) located within the Orange Crest - Mission Grove area (OCMGA) of Riverside CA, with the 2.5-mile North Reach of the Perris Valley Pipeline (NRPVP) being the first constructed portion of the PVP (see Figure 1 link below). The NRPVP, which was constructed during 2008-2009, extends northward along the west side of the I-215 from Cactus Ave to, and beneath, the Alessandro Blvd/Sycamore Canyon Blvd intersection, westward beneath the westbound lanes of Alessandro Blvd to Northrop Dr, and finally jogs generally north-northwest to the Mills WTP. The NRPVP and OCMGA are underlain by in situ-derived alluvial sediments that overlie a jointed shallow crystalline bedrock complex (Figure 2; Morton & Cox, 2001), into which paleochannels had been eroded prior to current accumulation of alluvium. Construction of the NRPVP included the excavation of an approximate 30-foot trench into the fractured bedrock and overlying alluvium from the Mills WTP eastward to the Alessandro Blvd/Sycamore Canyon Blvd intersection, a SE-trending tunnel beneath this intersection to a large tunnel support pit on the SE corner of this intersection (Figure 3), and then southward to Cactus Ave. 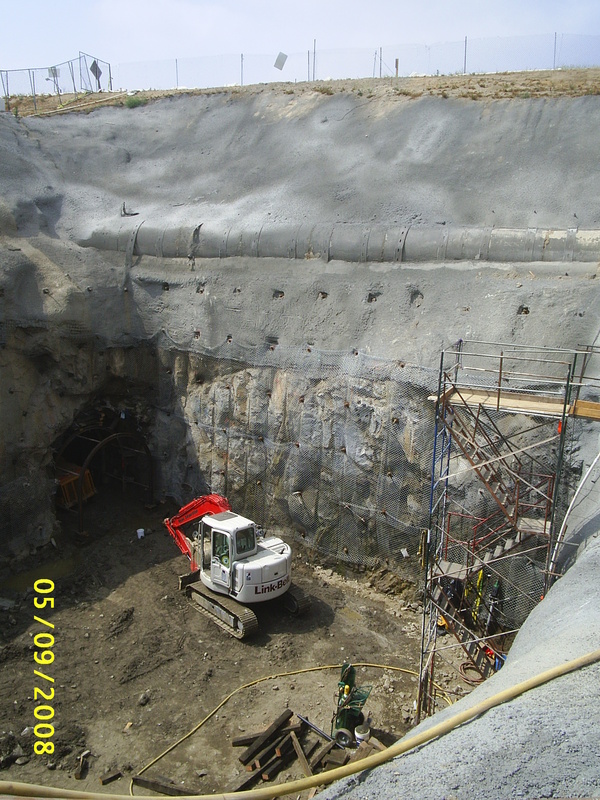 This page and the associated presentation addresses only the portion of the NRPVP that was constructed between the Mills WTP and the tunnel support pit. As mentioned on the preceding page ("Orange Crest - Mission Grove Area"), historical aerial photographs dating back to 1938 indicate that the groundwater originating from the OCMGA is anthropogenic, as shown by the establishment of "swamp" willows within many of the drainages that ovelie the noted paleochannels (see below, Figure 10) only after OCMGA development (landscape irrigation) within associated up-drainage areas. NRPVP trench centerline topography generally mimics the overlying topography (Figure 4). Specifically, this includes a trench topographic high point located approximately 500 feet west of the Alessandro Blvd/Barton St intersection (~Station 38+00) that acts as a trench "groundwater divide". From this topographic high point, the trench slopes westward approximately 2,300 feet northwest to a west topographic low point located within the bend in the west portion of the trench (~Station 15+00), and eastward approximately 7,000 feet to an east topographic low point located just west of the tunnel (~Station 107+00). Accordingly, groundwater flowing within and adjacent to the noted paleochannels are intercepted by the trench and flows toward either topographic low point away from the trench groundwater divide. The pipeline contractor encountered unanticipated significant volumes of groundwater during trench excavation, such that construction delays resulted in the pipeline being completed on a longer than contracted schedule. 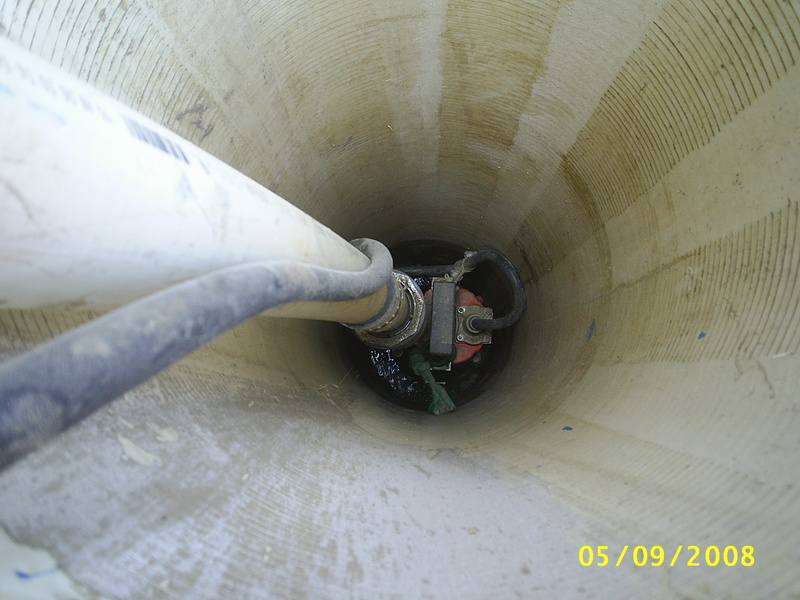 To combat the groundwater situation, several groundwater pumping wells were installed within the tunnel support pit (example shown in Figure 5) and several portable pumps were used to remove groundwater from the trench (example shown in Figure 6) to allow tunnel advancement and pipeline/pea gravel envelope installation. Two companies that consulted on the NRPVP (DCI and LGC Inland, Inc.) independently measured groundwater pumping rates from various tunnel/trench locations. 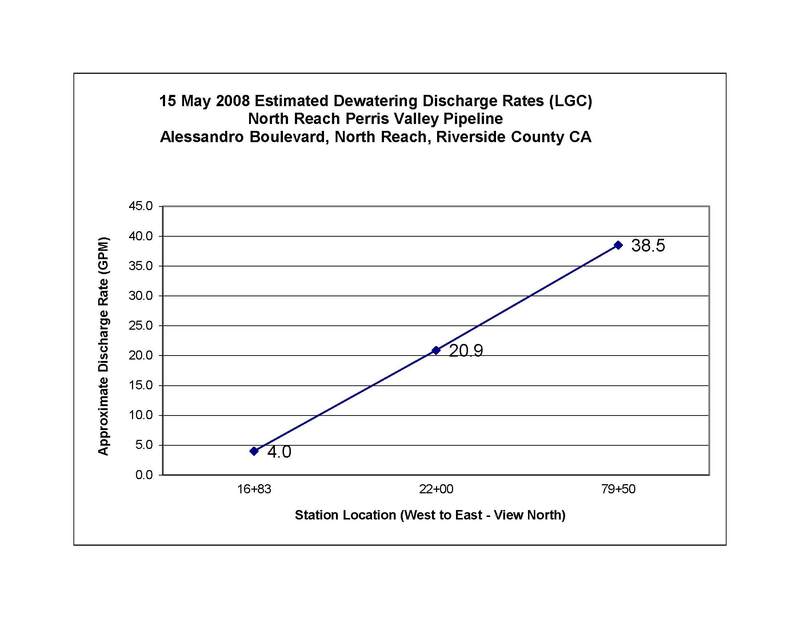 May 2008 (LGC Inland, Inc.) cumulative discharge rates ranged between approximately 63.4 - 131 GPM (91,296 - 188,640 GPD; 33 - 69 MGY; 102 - 211 AFY) (Figures 7 and 8), whereas the July 2008 (DCI) cumulative discharge rate was approximately 108.6 GPM (156,355 GPD; 57 MGY; 175 AFY) (Figure 9). 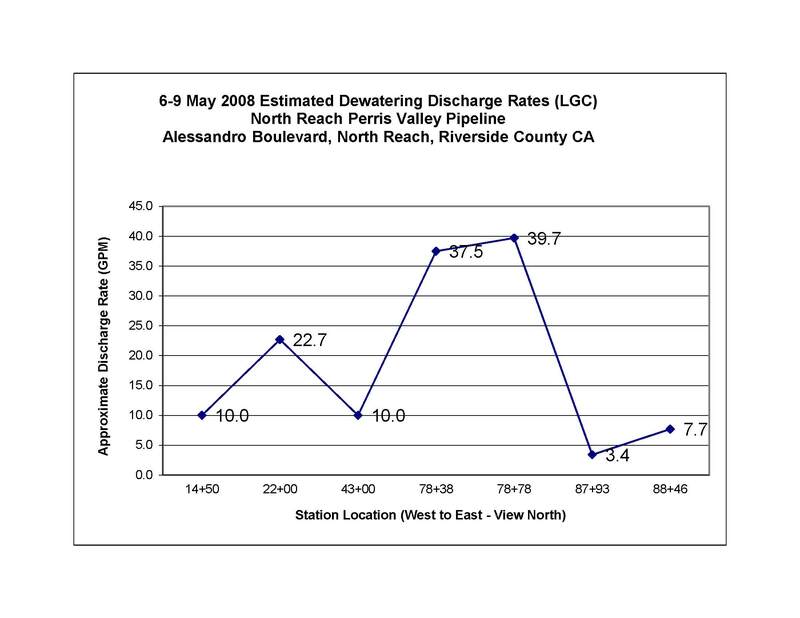 It should be noted that the relatively low discharge rates depicted on Figures 7 and 9 (at approximate Stations 43+00 and 42+27, respectively) are located just west of the groundwater divide located near Station 38+00, essentially showing the separation of westward/eastward groundwater trench flow on either side of this location, the trench groundwater divide. Furthermore, although Figure 8 does not show the same features per se, this is likely due to fewer pumping locations at that time - but still shows (somewhat) the relative amounts of groundwater trench flow on either side of the trench groundwater divide. Field observations, including those from an on-going personal OCMGA study that began during the LNR-Meridian project (see preceding page) involving 40 radially-oriented drainages originating from the OCMGA (Figure 10), indicated that much of the groundwater originated from residential/business landscape irrigation and, specifically with regards tp the NRPVP, almost 200 septic systems located primarily along the south side of Alessandro Blvd, between Barton St and Gem St (Figure 11). This groundwater, which normally flowed northward into Sycamore Canyon via bedrock fracture flow and the paleochannels that had been eroded into the shallow bedrock surface, had been intercepted by the NRPVP trench and then redirected eastward toward the tunnel. Large concrete thrust blocks located at both ends of the tunnel act as buried groundwater "dams", preventing the eastward-redirected groundwater from passing through the tunnel toward the regional aquifer system that underlies nearby Moreno Valley to the east. Additionally, groundwater originating from the over-irrigation of business/residential landscaping located to the west of the septic systems and intercepted by the trench flowed westward toward the trench bend (Figure 4). 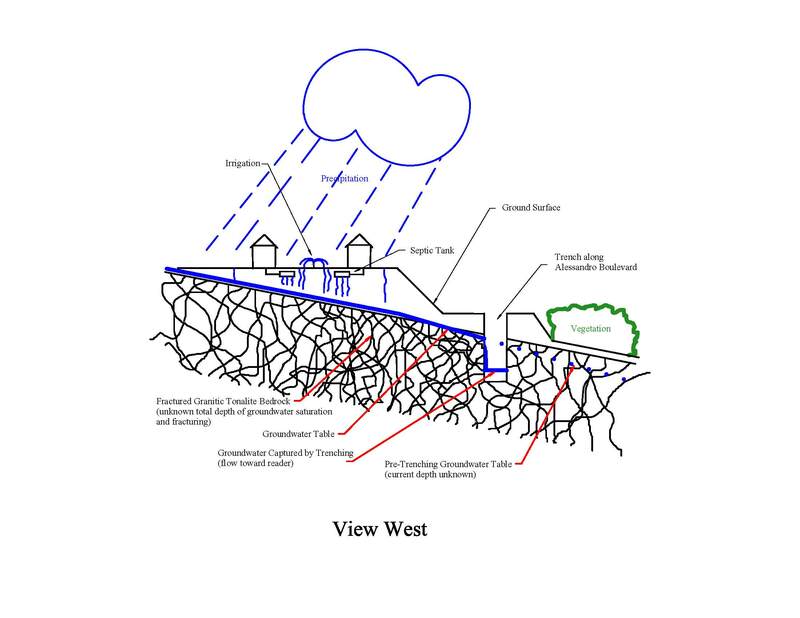 Essentially the NRPVP trench functions as a large-scale "French drain", intercepting local groundwater and re-directing it toward the east and west on either side of the trench groundwater divide. Although pea gravel was installed around the piping to ground surface, it did not alter the trench functioning as a large-scale French drain except by slowing down the velocity of the groundwater within the trench. Following the installation of the NRPVP piping/pea gravel to ground surface, and prior to re-paving of the westbound lanes of Alessandro Blvd, very shallow groundwater located within feet of the ground surface was observed in the vicinity of the east topographic low point (Figure 12), presumably the result of the re-direction of groundwater to this location via the east portion of the trench. 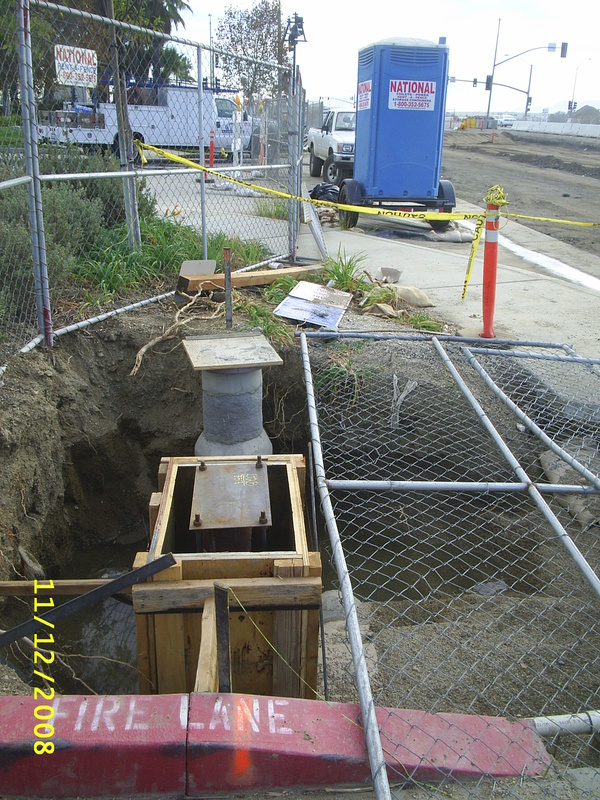 As a permanent mitigation to this condition, MWD directed the pipeline contractor to install a horizontal well (equipped with a down-gradient slurry wall located immediately down-trench to the west) beneath the westbound lanes of Alessandro Blvd west of Gem St, near Station 89+25.92, such that it would passively collect groundwater re-directed toward the east topographic low point and discharge it to an existing drainage (D35) to the north (Figure 13) via a PVC piping outfall during early 2009. 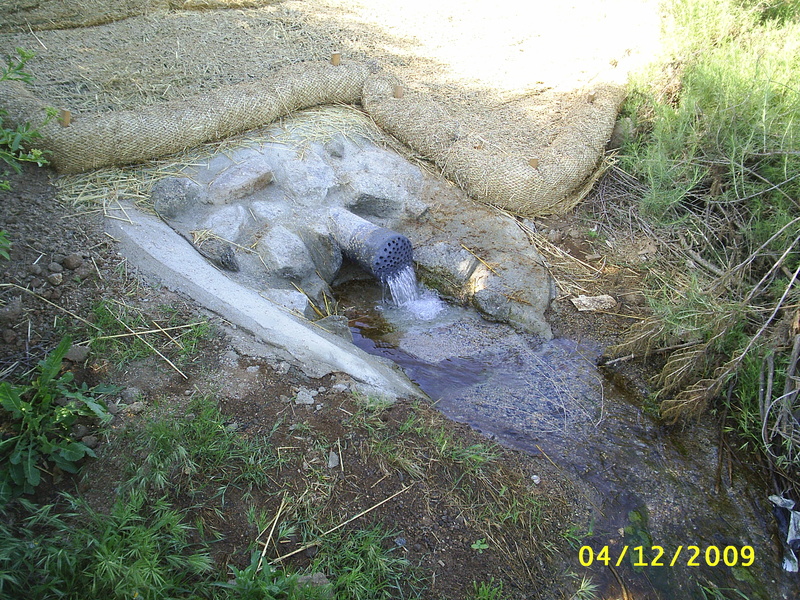 As part of the on-going personal study of surface water outflow originating from over-irrigation of OCMGA residential/business landscaping (see preceding page "Orange Crest - Mission Grove Area" and associated discussion), the MWD outfall discharge rate was visually estimated on an annual basis. 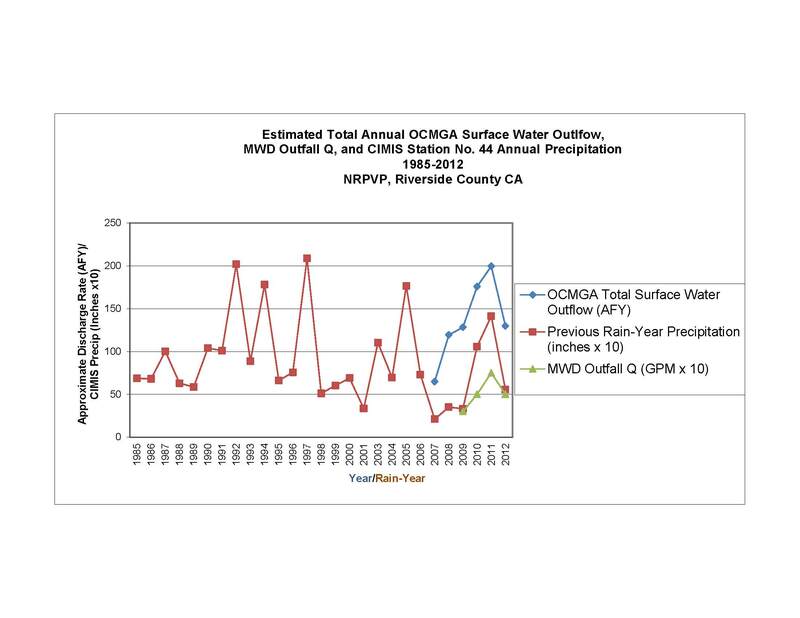 Figure 14 shows the annual vicinity precipitation, total OCMGA surface water flow rates, and the MWD outfall discharge rates up to the most recent data collection that occurred during early July 2012. 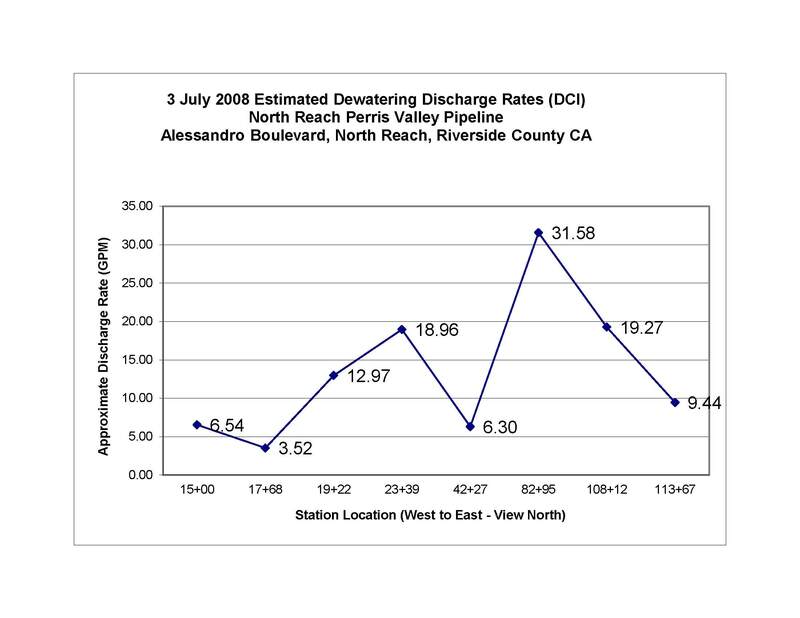 The MWD outfall discharge rates mimic those of the OCMGA surface water flow rates, which are due in part to annual changes in precipitation. A conceptual model describing at least two (2) possible routes of septic system/landscape irrigation water to be intercepted by the NRPVP has been developed (Figure 15). The routes are: (1) vertical downward percolation of water to buried interface between alluvium/bedrock complex, gravity flow along interface toward/along paleochannel axes; and (2) lateral fracture flow of unknown portion of percolated water within uppermost portion of bedrock complex, toward and into the trench, and then either east or west from the trench groundwater divide. 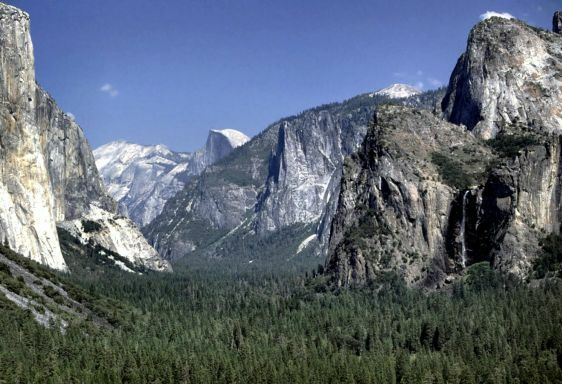 Figure 16 shows Bridal Veil Falls discharging into Yosemite Valley, not unlike groundwater being intercepted and re-directed by the NRPVP trench. On 6 August 2012, two (2) King High School (Riverside CA) students that were accompanied by their science teacher and Mr. Deane collected a groundwater sample from the MWD outfall for subsequent field analysis. The field analysis indicated that the sample contained 7.7 ppm nitrate and tested positive for coliform. Both of these constituents of concern are common by-products of septic systems. RESULT: Client used DCI's draft reports in support of a successful lawsuit against MWD to recoup financial losses due to the unanticipated significant volumes of groundwater encountered during the installation of the NRPVP. Mr. Deane appreciates the opportunity to have worked with Mr. Scott Richtmyer, EG/PG formerly of LGC Inland, Inc., Murrieta CA, on the NRPVP project.